Maeystown bed and breakfast travel guide for romantic, historic and adventure b&b's. 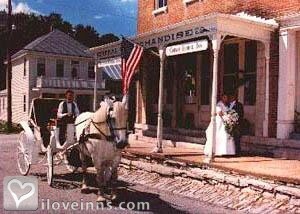 Browse through the iLoveInns.com database of Maeystown, Illinois bed and breakfasts and country inns to find detailed listings that include room rates, special deals and area activities. You can click on the 'check rates and availability' button to contact the innkeeper. Maeystown, Illinois lies in the state's wine region and the Heartland Rivers Wine Trail is a perfect tour. Visit Schorr Lake Vineyard and Winery in Waterloo and the Lau-Nae Winery in Red Bud. Cycle the scenic road to Fults Hill Prairie Nature Reserve. This road passes by two historic sites, Fort Kaskaskia and Fort de Chartres. Maeystown bed and breakfast inns' guests may also schedule a ferry trip to cross the great Mississippi River on their way to Ste. Genevieve. The top restaurants near Maeystown are Gallagher's, J Fire's Market Bistro, and JV's Downtown Bar and Grille. By Corner George Inn.